This year I’ve decided to hone my culinary skills and will be tackling one foodstuff a month. I’ve started the year with one of my favourite foods, I’ve been on a bread making mission. I’m already a dab hand making soda bread and beer bread which requires no yeast and can be slapped in the oven in just a few minutes but what I wanted was to bake proper bread like an artisan baker would. With this in mind I’ve been devouring bread making books, blogs and articles in newspapers to find the secret to good home made bread. 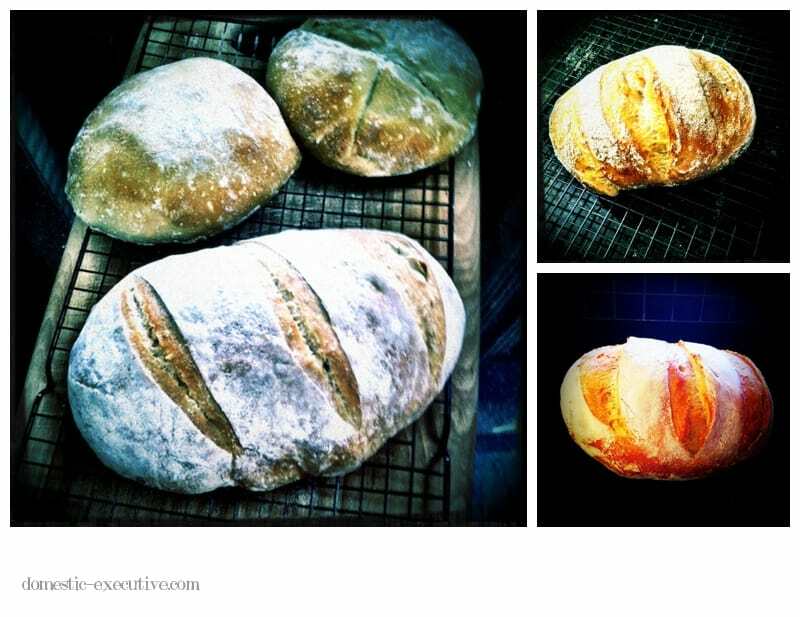 After trawling through acres of information about the art and science of bread making it became clear what I was looking for was less a methodology of how to make bread but more a way of creating a bread making routine. A way of baking bread that would a regular habit and not a weekend luxury. Just as I was starting to despair I found a revolutionary no kneed approach to bread making. “What no kneed?” you might be thinking. That’s like bread without butter. But yes there is indeed a way to make tasty bread at home with just a few minutes of active effort and without clock watching or rising before dawn to have freshly made bread for breakfast. This month I’ve been using the Artisan Bread in 5 minutes a day methodology using a book that I got for Christmas. 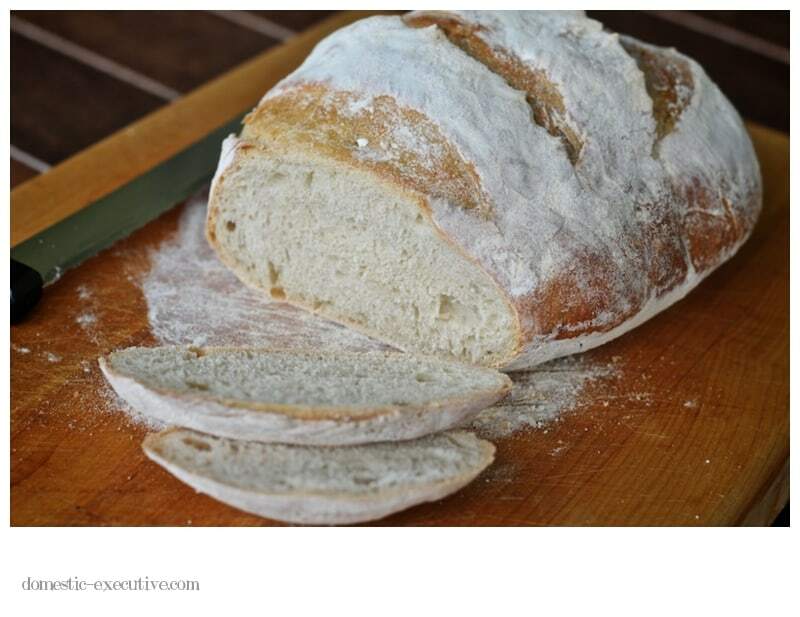 This approach to bread making has been around for quite a few years with quite a food blogging frenzy caused when Mark Bittman of the NY Times posted a recipe created by Baker, Jim Lahey. But this methodology was not without it’s controversy best summarised by Michael Rhulman who after his initial dismissal was converted to a no kneed approach. In a nutshell, you make a bread dough that has a high water content which after it’s initial rise can be kept in the fridge until you want to bake. You then pull out some of the dough, shape it and let it rise again before baking for around 30 minutes. The dough takes a bit of handling but with practice it get’s easier. The beauty of this method is you get really tasty bread with the minimum of fuss. Every time we’ve had consistently good loaves with our most recent bake the best yet after I fiddled with the flour and water ratio to give the dough more body for shaping and resting before baking. We’ve tried plain white bread, wholemeal and brioche using the same methodology and the recipes have been consistently successful. I’ve been tweeting about the results. The Brioche bread dough was a total revelation to me. I’ve rarely eaten brioche but now I’m hooked for that special weekend treat. 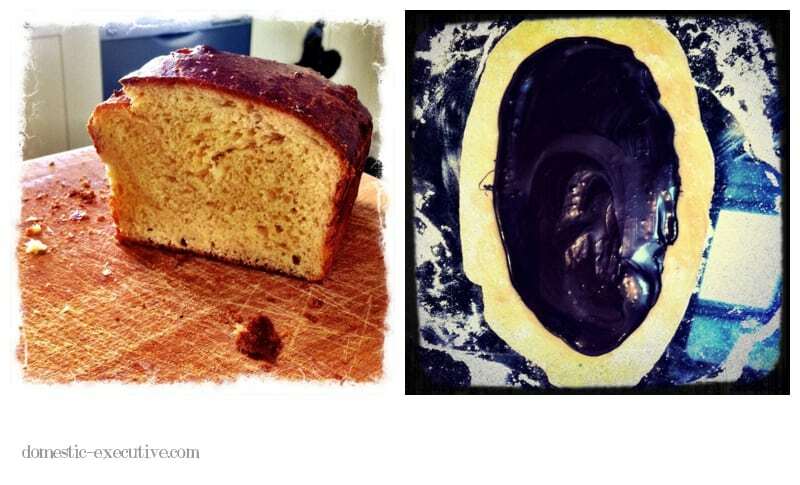 And for the holiday weekend we lashed out and used the brioche dough to make a chocolate bread make using a delicious chocolate ganache. 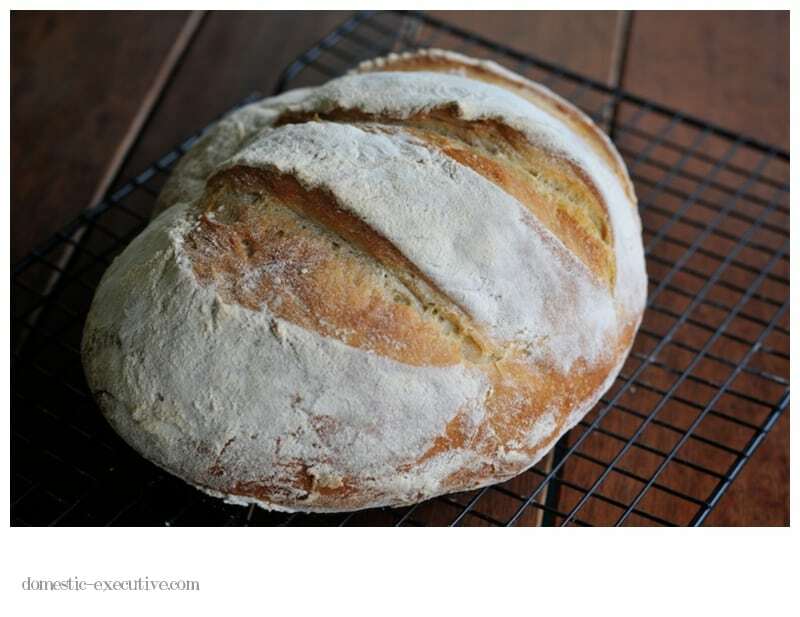 Although I haven’t yet tackled “proper” bread making I feel more confident to give it a go so we can make a comparison with the no kneed method. For now though we have a tried and tested method that goes fantastically well with our latest batches of jam and marmalade. The bread maker still makes a perfectly good loaf of bread and is ideal for his Lordship’s lunch sandwiches but I’m looking forward to extending my no kneed repertoire further as well try out the varying bread making techniques. Oh, if you’re interested in trying out this method – here’s a link to the main recipe which I’ve found to be so reliable. Next month I’m moving into cheese making as I was given a voucher for a home cheese making course which I’ll be attending this coming weekend. Previous Post: « Yee haw …. You live too far away. Bread and then cheese. Those are my two main food groups! Have you tried making French Toast with your Brioche? I bet you’d like it! Hi Sabrina – french toast with Brioche sounds wonderful although I am frightened of adding more eggs to an already egg laden bread. But there again, worth a try once! It looks amazing, I have never tried the no knead breads and diligently spend 10 mins kneading mine but this looks so amazing I will have to try it. Hi Alli – in my research for bread making Dan Leopard suggests little and often kneeding rather than the 10 minute grind. Haven’t tried yet though! Your bread looks amazing. That Artisan Bread in 5 book has been on my wish list for ages – have also been meaning to try the no-knead bread for ages too. You’ve inspired me to make it sooner rather than later. Especially if you can make great brioche – something I’ve never been game to make,but often wanted to since you pretty much can’t buy it. Thanks for the inspiration. I’m sure you’ll love it Sue – if you want me to email you the brioche recipe let me know. Your bread really does look amazing. Hubby and I do make bread, well to be honest, it’s sort of become ‘his’ thing now. The trouble is working out when to cook it so, like you say, we aren’t having to rise at down just so we can have something to spread our marmalade on at breakfast. Thanks for the recipe link – I’ll pass it on to hubs. I’m sure this sill sort your timing problems out Heather – that was always my difficulty, getting the timing right. Hi Julie, All that bread just looks so…well I just want to devour the lot 🙂 Sounds like a great way to organize the bread baking, and there isn’t anything quite like fresh baked bread straight out of the oven. Beautiful loaves! I can smell them from here!